On 3 July 2018, a true Warrior was laid to rest at Fort Benning, Ga. Milton Lockett Jr. joined the US Army in 1952. He served a tour of duty in Korea and two tours of duty in Vietnam. Lockett completed Ranger School in 1959 (class 06-59) and stayed on to become the first African American Ranger Instructor. Ranger Lockett would later complete 3 separate tours (a total of 12 years) with the US Army Ranger Department. Ranger Lockett was chosen to display hand to hand combat tactics to President John F. Kennedy during a Ranger In Action Demonstration at Fort Bragg N.C, he is also a member of the first Ranger in Action Team. Ranger Lockett also completed Airborne School during Class 41-71. MSG Lockett served as a leader in 1st Infantry Division's first Long Range Reconnaissance Patrol and later with L/75th Ranger, 101st Airborne Division. 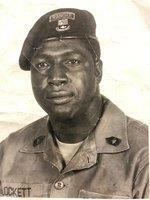 In 2001 MSG(Ret) Milton Lockett was inducted into the US Army Ranger Hall of Fame. Milton Lockett was also a leader in his community.